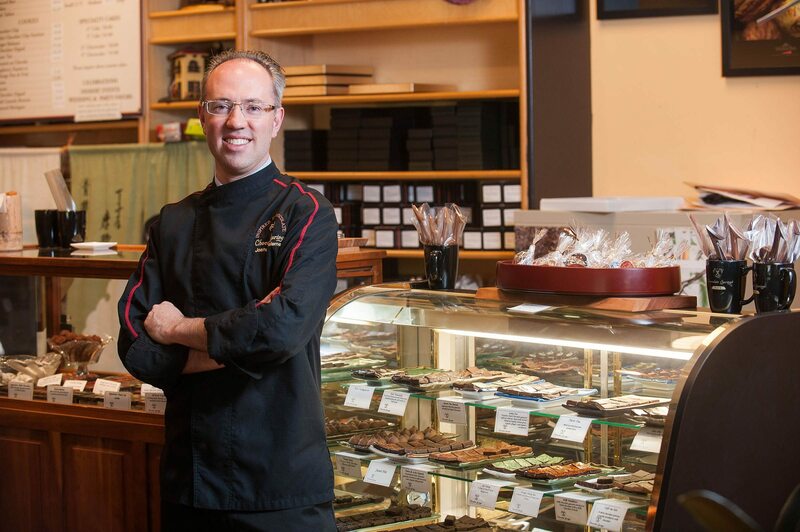 Joshua Needleman, creator and chocolatier of Chocolate Springs Café, has been fascinated with chocolate all of his life. Joshua is a native of Lebanon Springs, New York: a town that was named for its year-round natural hot water spring that was believed to have therapeutic healing powers by the Native Americans. Ulysses S. Grant and Marquis Lafayette are among the many notable historical figures that made pilgrimages to the Lebanon Springs. The name Chocolate Springs Café pays homage to Joshua’s hometown and provides its own modern-day therapeutic escape..
Joshua first entered the culinary field at age sixteen, and established his foundation in discipline and hard work, while working at Shuji’s Japanese restaurant, a New Lebanon historic landmark. While working at Shuji’s during his high school years, Joshua developed a deep love and appreciation for Japanese culture that inspired an Asian theme for Chocolate Springs Café. After graduating from the Culinary Institute of America in 1994 with an externship at Canyon Ranch in Tucson, Arizona, Joshua began to refine his skills at the Wheatleigh Hotel in Lenox, Massachusetts. Joshua then relocated to France to explore another culture and learn directly from the French culinary traditions. He was inspired by the artistic beauty and admired the spectacular pastry and chocolate shops. Joshua had the opportunity to work at several prestigious establishments, including a stage with Maitre Chocolatier Michel Chaudun. Joshua returned to the United States to work again at the Wheatleigh Hotel as well as at Canyon Ranch in the Berkshires and finally as pastry chef at the Cranwell Resort and Spa. He then serendipitously had the great fortune to be offered a job at La Maison du Chocolat in New York City. Joshua moved to New York to work at both their Madison Avenue and Rockefeller Center boutiques. Once again an appreciation for cultural diversity and art were fueled. Joshua was honored to work with founder and Maitre Chocolatier Robert Linxe who shared his passion for chocolate. During his employment Joshua was invited on three trips back to Paris to visit the facilities of La Maison du Chocolat. Once again, the rigors and precision involved in this art-form were reinforced. Ultimately, Joshua traveled to Japan to experience for himself the culture that he had admired for so many years. With the desire to fuse European tradition, Japanese aesthetics, and his own local roots, Joshua returned home to the Berkshires to open Chocolate Springs Café in September of 2003. Since opening, Chocolate Springs Café has become a special destination for locals and tourists alike. The serious hot chocolate and velvety mousse cakes have become local favorites. The Champagne Cognac Truffles were featured in the August 2005 edition of Time Magazine. Other articles have appeared in Sante Magazine, Berkshire Living, Travel and Leisure Magazine, The New York Times and the Berkshire Eagle. Chocolate Springs was recognized in the March 2006 issue of SAVEUR magazine as one of their TOP 10 star chocolate makers in the United States. In September of 2004, Chocolate Springs started offering its selections in Boston at the South End restaurant, Formaggio. Among the delectables were all-dark Cocoa Truffles, an assortment of bon-bons with fresh infusions of mint and raspberry, as well as “Chai This,” which blends tea, exotic spices, and chocolate. Chef and owner, Joshua Needleman, introduced these items with a special chocolate-tasting event. Joshua shares his knowledge of working with chocolate and its health benefits at frequent demonstrations and lectures. He participated in a chemistry demonstration at Williams College in Williamstown, Massachusetts with professor, Hodge Markgraff, who analyzed chocolate’s chemical structure and antioxidant properties. Other demonstrations have been held at the Chocolate Show in New York City, Canyon Ranch of the Berkshires, Cranwell Resort and Spa, as well as on site at Chocolate Springs Café. Online, you now have the option to choose from a broad spectrum of delicacies. We will happily ship your gifts and treats anywhere in the United States. Joshua’s dream of Chocolate Springs continues to grow thanks to the support of all of its valued patrons. Serious chocolate lovers understand the sense of satisfaction and well being that emerges as a piece of rich dark chocolate melts on their tongue Chocolate has been, and will continue to be, the ultimate comfort food. There is a growing body of scientific evidence that explains this phenomenon. Chocolate contains four chemicals that stimulate the brain, caffeine, theobromine, phenylethylamine and N-acylethanolamines. These chemicals in combination turn on pleasure centers in the brain. That “chocolate high” is real. Chocolate also contains flavanols, natural antioxidant compounds that may ward off vascular disease linked to heart attacks, stroke, diabetes, dementia and hypertension. A study published in the Harvard Women’s Health Watch and the American Journal of Clinical Nutrition said, “cocoa and chocolate, produced from cacoa beans, contain high amounts of polyphenols and other flavanoids, naturally occurring antioxidants whose effects are associated with reduced cardiovascular risk.” This finding supports the conclusion that diet supplemented with chocolate products can slow oxidation of LDL or “bad” cholesterol and can increase the level of HDL or “good” cholesterol. Therefore, science has finally proven what most people have known for many years. Quality Dark Chocolate is good for you. The mission of Chocolate Springs is to continue to spread and promote this time- honored, magical sensation of savoring exquisite chocolate.